Bantam Spectra is the science fiction division of American publishing company Bantam Books, which is owned by Random House. Jacen Solo is a fictional character in literature based on the Star Wars film series, set in what is now designated as the non-canonical Star Wars Legends continuity. 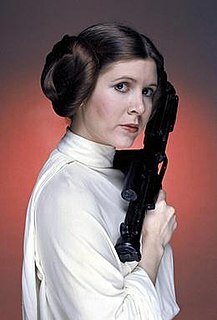 Princess Leia Organa of Alderaan is a fictional character in the Star Wars franchise, portrayed in films by Carrie Fisher. Introduced in the original Star Wars film in 1977, Leia is princess of the planet Alderaan, a member of the Imperial Senate and an agent of the Rebel Alliance. She thwarts the sinister Sith Lord Darth Vader and helps bring about the destruction of the Empire's cataclysmic superweapon, the Death Star. In The Empire Strikes Back (1980), Leia commands a Rebel base and evades Vader as she falls in love with the smuggler, Han Solo. In Return of the Jedi (1983), Leia leads the operation to rescue Han from the crime lord Jabba the Hutt, and is revealed to be Vader's daughter and the twin sister of Luke Skywalker. The prequel film Revenge of the Sith (2005) establishes that the twins' mother is Senator Padmé Amidala of Naboo, who dies after childbirth. Leia is adopted by Senator Bail and Queen Breha Organa of Alderaan. In The Force Awakens (2015) and The Last Jedi (2017), Leia is the founder and General of the Resistance against the First Order. She and Han have a son named Ben, who adopted the name Kylo Ren after turning to the dark side of the Force. Han Solo is a fictional character in the Star Wars franchise, who is a pilot from the planet Corellia. A primary character in the original film trilogy, Han is the captain of the Millennium Falcon, along with his Wookiee co-pilot Chewbacca, whereby both pilots became involved in the Rebel Alliance's struggle against the Galactic Empire. During the course of the Star Wars narrative, Han becomes a chief figure in the Alliance and the love interest of Princess Leia. In the sequel trilogy, Han is Leia's husband and the father of fallen Jedi, Kylo Ren. 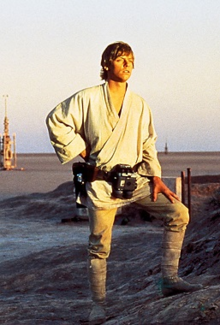 Luke Skywalker is a fictional character and the main protagonist of the original film trilogy of the Star Wars franchise created by George Lucas and portrayed by Mark Hamill. Skywalker first appeared in the original 1977 film and returned in The Empire Strikes Back (1980) and Return of the Jedi (1983). Three decades later, he portrayed the character in the Star Wars sequel trilogy beginning with The Force Awakens in 2015 and The Last Jedi in 2017. Hamill is slated to reprise his role in the upcoming Episode IX (2019). The Galactic Empire is a fictional autocracy featured in the Star Wars franchise. It was first introduced in the 1977 film Star Wars and also appears in its two sequels: The Empire Strikes Back (1980) and Return of the Jedi (1983) and is the main antagonist faction of the original trilogy. By the time of the sequel trilogy, which starts three decades following the events of the original trilogy, the government has since collapsed and has been succeeded by the First Order. Chewbacca, nicknamed "Chewie", is a fictional character in the Star Wars franchise. He is a Wookiee, a tall, hirsute biped and intelligent species from the planet Kashyyyk. Chewbacca is the loyal friend and first mate of Han Solo, and serves as co-pilot on Solo's spaceship, the Millennium Falcon. Within the films of the main saga, Chewbacca is portrayed by Peter Mayhew from episodes III to VII. Suotamo took over the role alone in Star Wars: The Last Jedi and reprised the role in Solo: A Star Wars Story. The character has also appeared on television, books, comics, and video games. C-3PO or See-Threepio is a humanoid robot character from the Star Wars franchise who appears in the original trilogy, the prequel trilogy and the sequel trilogy. Built by Anakin Skywalker, C-3PO was designed as a protocol droid intended to assist in etiquette, customs, and translation, boasting that he is "fluent in over six million forms of communication". 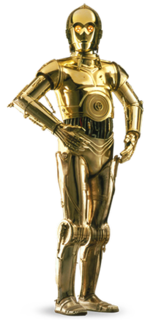 Along with his astromech droid counterpart and friend R2-D2, C-3PO provides comic relief within the narrative structure of the films, and serves as a foil. Anthony Daniels has portrayed the character in ten of eleven Star Wars cinematic films released to date, including Rogue One and the animated The Clone Wars. C-3PO and R2-D2 are the only characters to appear in all of the films except Solo: A Star Wars Story. The Skywalker family is a fictional family in the Star Wars franchise. Within the series' fictional universe, the Skywalkers are a bloodline with strong inherent capabilities related to the Force. Luke Skywalker, his twin sister Princess Leia, and their father Darth Vader are central characters in the original Star Wars film trilogy. Vader, in his previous identity as Anakin Skywalker, is a lead character in the prequel film trilogy. Leia and Han Solo's son, and also Luke's nephew, Kylo Ren plays a crucial role in the sequel trilogy of films. Balance Point is the sixth installment of the New Jedi Order series set in the Star Wars universe. It is a science fiction novel written by Kathy Tyers and published in 2000. Star Wars: The New Jedi Order - Vector Prime is a science fiction novel by American writer R. A. Salvatore and published in 1999. It is the first installment of the New Jedi Order series set in the Star Wars universe. The book has received much controversy for the death of a prominent character from the films, despite George Lucas's approval. On its release, the book was featured on the New York Times Hardcover Bestseller List. Star by Star is the ninth installment of the New Jedi Order series set in the Star Wars expanded universe. It is a science fiction novel written by Troy Denning and published in 2001. Dark Tide: Onslaught is the first novel in a two-part story by Michael A. Stackpole. Published and released in 2000, it is the second installment of the New Jedi Order series set in the Star Wars universe. The Unseen Queen is a science fiction novel set in the Star WarsStar Wars expanded universe. It is the second book in the Dark Nest Trilogy by Troy Denning. It is set 35 years after the Battle of Yavin. In the chronology of the Star Wars novels, it is set after the first book of the Dark Nest trilogy, which is The Joiner King, and before the third book of the Dark Nest trilogy, which is The Swarm War. The Swarm War is a novel set in the Star Wars expanded universe. It is the third and final book in Troy Denning's Dark Nest Trilogy. The book is set 35 years after the events of Star Wars Episode IV: A New Hope. Bloodlines is a 2006 Star Wars novel by Karen Traviss, the second book in the Legacy of the Force series. It takes place in the fictional Star Wars expanded universe, about 35 years after Return of the Jedi. It was followed by Troy Denning's Tempest. Tempest is a science fiction novel by American writer by Troy Denning, released in November 2006, in both paperback and hardcover edition. It is the third novel in the Legacy of the Force series, taking place some 40 years after the original Star Wars trilogy. Inferno is a science fiction novel by American writer Troy Denning, released in paperback on August 28, 2007. It is the sixth book in the Legacy of the Force series. Fury is the seventh book in the Legacy of the Force series. It is a paperback by Aaron Allston and was released on November 27, 2007. It was #4 on the New York Times Best Seller list. Outcast is a novel by Aaron Allston that was released on March 24, 2009. It is the first novel in the Fate of the Jedi series and published as a hardcover.